The driver’s side door mirror has outer and inner segments. The outer segment is slightly curved to provide a wider angle view than a standard flat mirror. This wider view may help you check areas that are not visible using a standard door mirror. 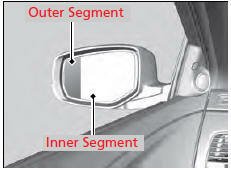 Objects visible in the outer segment of the driver’s side door mirror appear smaller than objects in the rest of the mirror. But in fact, they are closer than they appear. Do not rely on your mirrors. Always look to the side and behind your vehicle before changing lanes.